What Happens To The Ocean If We Use It For Energy? Renewable energy generators may not be as toxic as coal plants, but they come with their own set of problems. Solar installations can impinge on wildlife habitats, wind turbines can garble air traffic control, and wave energy devices can cause underwater noise that has unknown consequences for marine life used to living in relative silence. So IBM and The Sustainable Energy Authority Ireland (SEAI) are teaming up to produce one of the largest collections of underwater acoustic data ever recorded, all as part of an attempt to figure out what impact wave energy devices have on their surrounding ecosystems. Wave energy’s potential is virtually unlimited. After all, the ocean has no shortage of waves. But there are no global noise standards for wave energy devices, and no one has ever assessed the impact of wave energy noise in the ocean–until now. 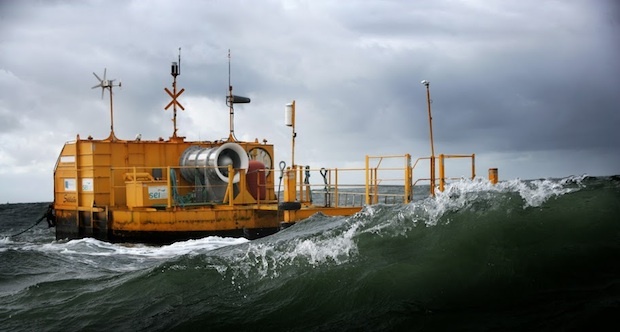 IBM’s system, which consists of sensing platforms, a communications infrastructure, and real-time, streaming analytics, will first be deployed in Galway Bay, Ireland, where manufacturers often test their wave energy devices. The bay is also home to the SmartBay project, a collaboration between IBM Research and the Marine Institute Ireland. In addition to the new acoustic analytics system, SmartBay monitors pollution levels, wave conditions, and marine life. In other words, the project is attempting to figure out what, exactly, wave energy does to the ocean. Next up: a larger grid-connected test site on Ireland’s west coast. After that, perhaps more wave energy deployments in Ireland, which currently imports 86% of its energy. And once researchers have a better idea about the environmental effects of wave energy devices, we may see more of them popping up across the globe.